Sciency Thoughts: Magnitude 1.3 Earthquake off the west cost of the Isle of Islay. Magnitude 1.3 Earthquake off the west cost of the Isle of Islay. The British Geological Survey recorded a Magnitude 1.3 Earthquake at a depth of about 7 km about 2.5 km off the west coast of the Isle of Islay in the Inner Hebrides Islands, at about 5.55 pm GMT on Sunday 20 March 2016. This was not a major event, and presented no threat to human life or property, but was felt on the island. The approximate location of the 20 March 2016 Isle of Islay Earthquake. Google Maps. Earthquakes become more common as you travel north and west in Great Britain, with the west coast of Scotland being the most quake-prone part of the island and the northwest of Wales being more prone to quakes than the rest of Wales or most of England. The precise cause of Earthquakes in the UK can be hard to determine; the country is not close to any obvious single cause of such activity such as a plate margin, but is subject to tectonic pressures from several different sources, with most quakes probably being the result of the interplay between these forces. Britain is being pushed to the east by the expansion of the Atlantic Ocean and to the north by the impact of Africa into Europe from the south. It is also affected by lesser areas of tectonic spreading beneath the North Sea, Rhine Valley and Bay of Biscay. Finally the country is subject to glacial rebound; until about 10 000 years ago much of the north of the country was covered by a thick layer of glacial ice (this is believed to have been thickest on the west coast of Scotland), pushing the rocks of the British lithosphere down into the underlying mantle. This ice is now gone, and the rocks are springing (slowly) back into their original position, causing the occasional Earthquake in the process. 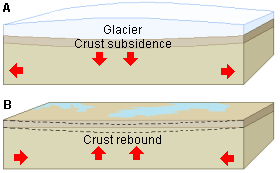 (Top) Simplified diagram showing principle of glacial rebound. Wikipedia. (Bottom) Map showing the rate of glacial rebound in various parts of the UK. Note that some parts of England and Wales show negative values, these areas are being pushed down slightly by uplift in Scotland, as the entire landmass is quite rigid and acts a bit like a see-saw. Climate North East. Witness accounts of Earthquakes can help geologists to understand these events, and the structures that cause them. If you felt this quake, or were in the area but did not (which is also useful information) then you can report it to the British Geological Survey here.